Supracolor from Caran D'Ache is widely recognised as one of the softest watercolour pencils around. 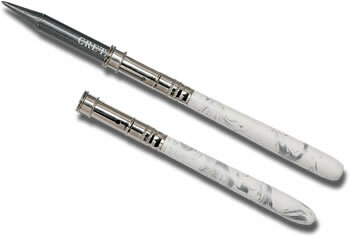 With a broad 3.8mm core these pencils have a really high breaking strength and give excellent coverage. Use a brush to apply water to your dry picture to create beautiful wash effects. Alternatively you can use the pencils onto all ready wetted paper and watch as the colour suffuses the page. In 120 beautiful colours it is really easy to find exactly the shade you need to create top quality watercolour pencil work. Supracolor is perfectly colour matched with the Caran D'Ache Pablo range - which is permanent, so the two pencils can be used in conjunction with one another if you need water resistant pencils for detail.